Newborough Forest at Newborough Forest (NRW)0300 065 3000work Forest or WoodlandToday the forest is a great place to relax in. With waymarked trails to explore and wildlife to discover. It's also still a working forest, so areas may be closed for your safety when timber is being removed. You can also get into the forest from the Malltraeth car park on the A4080, or why not visit Llyn Parc Mawr and its bird-rich lake? Don't forget Llys Rhosyr, one of the courts of the Princes of Gwynedd, on the way back to Newborough Village just before the church. 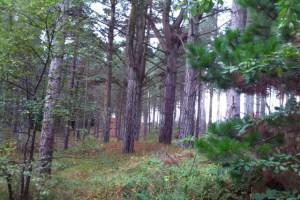 The wood is a small forest of mainly corsican pine planted on Newborough Warren sand dunes. The Newborough Beach car park gives access to forest trails, the beautiful Newborough beach and Ynys Llanddwyn. Use the clues to spot the carved wooden animals in the forest. This circular route goes through the forest and out to the outskirts of Newborough village before returning to the shade and shelter of the woods. If you download the PlacesToGo smartphone app, you can listen to the local stories of hardship, ingenuity and success that have helped to shape the land and the people here over the centuries. The Saint, Sand and Sea Trail gives an insight into Newborough’s unique geological and cultural features. Download the PlacesToGo smartphone app, and then listen to the audio files at the corresponding numbered posts. Please be aware Ynys Llanddwyn can be cut off in high tides and you should check tide times before starting this route. Corsica Cycling Trail (6 miles, 10 kilometres). The Corsica Cycling Trail is a waymarked circular route that is mainly on forest roads with views of the estuary. It goes through areas of mixed forest from mature pine trees to wet willow woods and passes by ponds, unusual rocks and wildflowers. The running trail is waymarked and starts from Newborough Forest beach car park. Please note: Ynys Llanddwyn, which is part of this route, can be cut off in high tides and you should check tide times before starting it. In 2011, the Commonwealth Mountain and Ultra Distance Running Championships came to North Wales and the 55km Ultra Distance trail race took place in Newborough. Today, you can run (or walk!) the official race route which has been waymarked from the beach car park. It goes through the peaceful forest, the vast dunes of The Warren and onto the island of Ynys Llanddwyn. The route includes stoned forest roads, narrow paths on sand with exposed tree roots, loose sand and shingle, uneven grassland and rocky terrain. The Trim Trail starts from Newborough Forest beach car park. The Newborough Trim Trail is designed to encourage and improve your fitness. It was developed by Age Friendly Communities project in partnership with Natural Resources Wales. There are 11 exercise stations along the track, two of which are wheelchair accessible. Horse riding in Newborough Forest is by permit only. Permits are available from the Newborough Forest Driving and Riding Association. Newborough Forest is half a mile south of the village of Newborough on Anglesey off the A4080. From the centre of the village of Newborough, take the minor road opposite the Post Office down to Newborough. Forest beach car park, is signposted to Llanddwyn. Follow this road until you reach a barrier (There is a daily charge for car parking)) and then follow the road down to the beach car park. You can also get into Newborough Forest from the Malltraeth car park on the A4080 between the villages of Newborough and Malltraeth. The nearest train stations are Llanfairpwll and Bangor. The OS grid ref is SH 413 669. Today the forest is a great place to relax in. With waymarked trails to explore and wildlife to discover. It's also still a working forest, so areas may be closed for your safety when timber is being removed. There is a daily charge for car parking in the main Newborough car park.